Quickly making a military time conversion can be confusing at first. For many, notating time in the 24-hour format is unfamiliar at best. When the military time clock moves past noon, it can get especially tough to deal with. In this example we will review how to convert 1300 military time to 12-hour standard time. It is important to keep in mind that the process for converting military time for 1300-2359 military time is exactly the same. So what is 1300 military time or “thirteen hundred hours?” To sort this out take the military time of 1300 and simply subtract 1200. Then add a colon between the hours and minutes, and attach a PM to the end. You know its PM vs AM by if the military time is equal or greater than 1200. 1200 or greater is always PM except for 2400 which is AM (12:00 AM). TIP: If you need to convert military time and the time is at or after 1 PM or 1300 (military time), then all you need to do is subtract 1200, add a colon between the minutes and hours, and put at PM after it. Nothing more than a little bit of math and adding a colon. 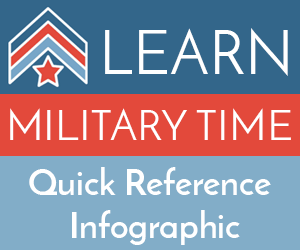 We hope you found this easy and can use it to better understand the process for converting 1300 military time into standard time! So, what do you think? Can you now go out into the world and convert military time on the fly? If not then stick around on the site and you will find many tools to help you including conversion charts, time clocks, and even tutorials on how to tell/read military time.